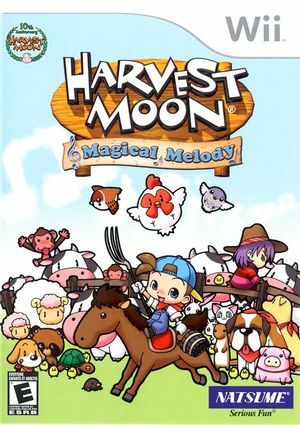 Harvest Moon: Magical Melody is an updated version of Bokujō Monogatari: Shiawase no Uta, which was only released in Japan. It features plenty of crops, a variety of animals to care for, tons of festivals to participate in and loads of events to create a fun and entertaining game play experience. Play as either a boy or girl: Each gender has 10 potential spouses. Compete against a rival farmer; Your productivity will be judged on a daily basis against that of your rival's...you will also compete against your rival in the festivals. Cultivate a wide variety of crops and trees. Raise cows, sheep, horses and chickens. Harvest Moon: Magical Melody offers 4-player minigames. Purchase different plots of land and expand your farm by building various extensions. The Harvest Goddess has turned to stone and the Harvest Sprites need your help to bring her back. You need to collect Musical Notes throughout the game in hopes of restoring her to her former self. There are 100 Musical Notes in the game and to collect the notes you must do a variety of different tasks, such as shipping a certain number of items, winning a festival or making friends with the wild animals found around your farm. Only by collecting a certain number of notes will the Harvest Goddess come back. The graph below charts the compatibility with Harvest Moon: Magical Melody since Dolphin's 2.0 release, listing revisions only where a compatibility change occurred. This page was last edited on 13 February 2018, at 07:51.